Inspired by the 2012 Smithsonian Folklife Festival program "Creativity and Crisis: Unfolding The AIDS Memorial Quilt," more than 140 Smithsonian staff, docents, interns, volunteers, and friends gave time, skills, energy, and supplies to create a quilt block honoring Smithsonian colleagues and friends who lost their battles with AIDS. 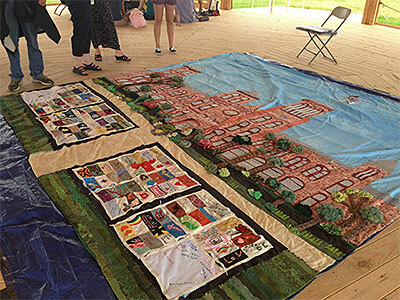 The 12-by-12-foot block depicts the Smithsonian Castle and gardens; mini quilts include a replica of existing panels in the AIDS Memorial Quilt, along with new ones that commemorate co-workers, friends, and relatives. The block will eventually be transferred to The NAMES Project Foundation to be added to the AIDS Memorial Quilt.